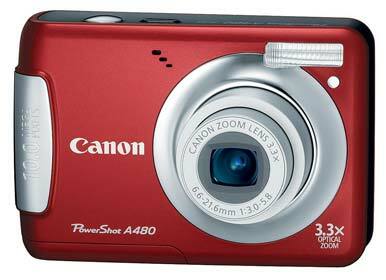 Canon’s PowerShot A480 is designed for people who want to shoot pictures without fussing over camera settings. It’s a dead-simple, reasonably stylish point-and-shoot camera to have on hand when you’re hanging out with friends and family. Available in black, blue, red, and silver, the boxy PowerShot A480 measures 3.6 by 2.4 by 1.2 inches and weighs 7 ounces. Its lens, whose focal length ranges from 37mm to 122mm (35mm equivalent), retracts into the body when you turn off the camera. The A480 slips easily in and out of a pocket. Its plastic body feels solid, and the raised metal plate emblazoned with “10.0 MEGA PIXELS” acts as a grip for securing your hold on the camera. The A480’s controls are basic and uncomplicated. The shutter and on/off buttons are located on top of the camera. The back has zoom controls; a playback button; a four-way button that acts as a navigation control when you are in the software controls or want instant access to set ISO, flash, or timer, or to toggle between macro, normal, and landscape modes; a Function/Set button; a mode button for switching shooting modes; and a menu button. The button layout is clear and you’ll learn it quickly as you tap the buttons with your right thumb. Most users of the A480 will rely on the camera’s Auto mode to determine the proper camera settings for a shot. Alternatively, you can choose from 12 scene modes: Aquarium, Beach, Fireworks, Foliage, Indoor, Kids&Pets, Long Shutter, Portrait, Night Snapshot, Snow, Sunset, and Super Macro. Though these modes sound friendly, you shouldn’t take the names absolutely literally. For example, the Aquarium shooting mode is useful for more than just taking pictures of fish in a tank; it sets the camera so that it can better shoot anything behind glass. Aside from the Auto and Scene modes, a Program mode lets you tweak settings such as sensitivity (ISO 80 to 1600), white balance, exposure, light metering, and color effects. While testing the A480, I used the Program mode more frequently than I expected. The Scene modes do a good job overall, but I got better results using the Program mode and adjusting the white balance, ISO, and light metering as appropriate. The A480 has a 2.5-inch LCD. The A480’s design encourages users to set the shooting mode and forget about it. The camera doesn’t have a wheel for quickly switching modes--a drawback when you step out of a museum, say, and into the bright daylight of a park. To switch modes, you have to press the Mode button, and then choose from among four on-screen selections: Auto, Program, Scene, and Movie. If you want to switch to one of Scene modes, you then have to navigate the Scene menu to find the scene you want. This process can take 7 to10 seconds, whereas with a mode wheel you can make the switch in a second. When you power on the A480, it’s ready to shoot almost instantly, and there’s no shutter lag. I noticed about a 1-second gap between shots with the A480 operating in Continuous Shooting mode. The A480 lacks image stabilization. This wasn’t a problem when I shot posed subjects while standing still in good lighting: Even subtle movements of the camera didn’t diminish image quality. But in low light, or when the camera’s movements were move pronounced, pictures were blurry. The absence of action shooting modes, a somewhat slow Continuous Shooting mode, and the omission of image stabilization means that the A480 is a poor choice at sporting events or any type of event involving fast movement. The A480 works best as a casual snapshooter. In our lab tests, the A480 did very well. Our jury gave the A480’s overall Image Quality a Very Good rating; photos had very little distortion, and exposure without the flash was accurate. Our jury also gave the A480 a Very Good rating for Color Quality; colors were accurate and pleasing, with no noticeable color shifts. The one weak spot was the A480’s image sharpness; our photo looked a little soft. The camera can record video (in AVI format) at 640 by 480 or 320 by 240 resolution, both at 30 frames per second. The video quality is good, but since there’s no image stabilization, movies suffer from the jitters if you hold the camera in your hand while recording. Zoom is disabled in movie mode, and in my testing the built-in microphone was sensitive to wind.